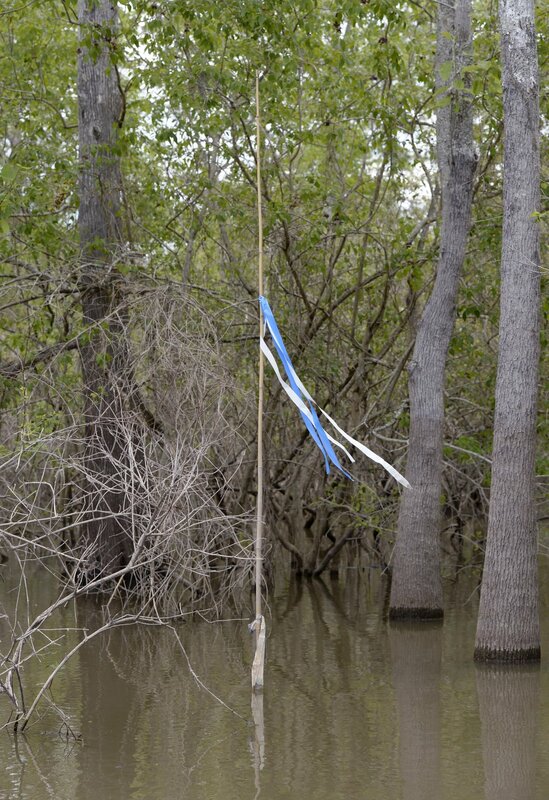 A flag marks one of the boundaries of the Bayou Bridge Pipeline project near Bayou Sorrel, La., on April 27, 2018. Testimony on day two of the Bayou Bridge eminent domain trial focused on whether the economic benefit of the pipeline would outweigh the costs of possible environmental degradation to sensitive wetlands in St. Martin Parish. The 162-mile Bayou Bridge pipeline would carry crude oil between Lake Charles and St. James Parish, but to do so, it is designed to go through undeveloped Buffalo Cove swampland in St. Martin Parish. Three of the estimated 700 heirs of the disputed land, Theda Larson-Wright and siblings Peter and Katherine Aaslestad, are refusing to sell their share of the land — a value one expert estimates at $1.11 for their portion — to Energy Transfer Partners, the company behind the pipeline. So now, Judge Keith Comeaux, a state district court judge in St. Martin Parish, will decide whether the company has the right to the property through eminent domain. Attorneys for the Center for Constitutional Rights and the Atchafalaya Basinkeeper claim ETP violated law by excavating and building on a 38-acre parcel of land in the basin without getting proper legal consent from all the individual landowners. ETP has argued that under Louisiana law, utility providers have the authority to legally expropriate property if they can prove it is for the public benefit. On Tuesday, attorneys ETP called to the stand David Dismukes, director of the LSU Center for Energy Studies, to testify about the pipeline's economic benefits. On Wednesday, Michael Avelle, environmental projects director for ETP, said the company followed all the U.S. Army Corps of Engineers and state environmental permitting codes for the pipeline. Avelle also noted how the trenching for the pipeline adheres to the right of way of a pre-existing pipeline in order to minimize the ecological impact. However, Scott Eustis, the wetlands environmental specialist for the Gulf Restoration Network, said the way the company trenched the pipeline route will be detrimental to the ecology of the Atchafalaya basin. Eustis noted the pipeline trench was dug into a pre-existing spoil bank, making it 5 feet above the water and thus taking oxygen out of the water and removing habitat for crawfish and other aquatic life. Avelle said the pipeline has 50-foot gaps every 500 feet so water can flow through to alleviate ecological issues associated with the spoil banks. Larson-Wright, one of the three landowners disputing ETP's claim, described her family’s history of owning the land and how it was affected during the Flood of 1926, which left the majority of the property underwater. When ETP attorneys asked Larson-Wright how often she visits the property, she admitted she had never set foot on the property and had not done anything to maintain it. Larson-Wright also admitted to protesting other pipeline construction projects, including the Dakota Access Pipeline. Peter Aaslestad, who filed the original injunction this summer that halted construction of the pipeline, said he has owned the property since 2007 when his father made an active donation of the land to his children. Aaslestad said ETP made an initial offer to buy his land, which he rejected. The company followed up with a second offer, which Aaslestad also rejected. The company then moved to seize the land from Aaslestad through eminent domain. Aaslestad, a resident of Virginia, then described that while he has never lived in Louisiana, his family has a long history in the state and the basin. However, he admitted he hadn’t set foot on the property before last week, hadn’t paid taxes on the property and hadn’t done anything to maintain the property. The Lafayette region gained 900 jobs over the year in October as Louisiana employment rose to 1,998,600. As leader of a multicultural church with a membership of about 1,800, Pastor Jay Miller of the Family Church is known for his humor and passion.